Recommended tires are Bridgestone Hoop. What if anything does the "Hoop" designator mean? All tires are basically hoops. It is the name given to a particular type of Bridgestone tyre. General tyres made one called Grabber. You'd have to contact the particular companies to find out how they choose names. Thx. So it's just a name. Thought this might be. According to my memory Hoop from Bridgestone were recommend early on, maybe on my 2009? I think Ill go with IRC as well. Dunlops were kind of "hard' riding. If you would think of one...What would be the recommendation list for softer/stickier tires that can improve SW handling? I currently have Michelin Power Pure installed (front+rear) and found them to be bit of "hard" and "jumpy" when going freeway speeds. I saw some peeps like IRC's some peeps like Hoops...please advise. Experiment with pressures silvering traveller. Start at standard pressure by the manual and then go 1 or 2 psi each way to see if it makes a difference. Don't go too far though. If the tyres are worn or old though just replace them, after 5 years tyres will be off regardless of how much tread they have. After that you can start spending money on rear shocks and changing the front suspension springs and/or oil, but it's the law of diminishing returns. At the end of the day the swing is what it is, it doesn't have the compliance of a big trail bike or the high speed handling of a sports bike... and it never will. Agree on above---the SilverWing is a scooter and a pretty good one at that. I had best long lasting luck with Michelin Power Pure SC on rear, worked ok with IRC on front. I get that @steve_h80. Having front upgraded with HyperPro and ride on improved handling A LOT! Previous owner decided to go with Michelin's (less than 2K miles ago) and that's what I have now. My experience with Michelin's are good with my other motorcycles but I have a feel that more softer front tire would be great match for SW. Tried with pressure, did not noticed any significant improvement in handling. If anything I can tell that front doesn't like to be UNDER-inflated. Best results are in a 3.2psi range. Thanks for the input! I think you meant 32 psi instead of 3.2psi. I find that riding one up, 30 front and 34 rear work best FOR ME. I still have the original IRC tires on my 2013 Swing. I have 12k miles and will be replacing the rear with either the IRC or Michelin Power Pure SC. Pirelli Diablos running 30psi front 35psi rear. Works for me. I like Pirelli Diablos also. They worked good for me. Having installed more than a thousand tires on scooters over many years, I can state from years of experience that Bridgestone has the best all round tires. The price is higher than the run of the mill tires, Admitted. Some prefer the cheapest tires, Then write in to complain. If you want the roundest, Best handling, Smoothest, Nearest balanced and proven tires, It is Bridgestone Hoop, Yes you will pay a little more for quality tires. But the rear squares off in no time, which then spoils the handling. So far I've had a great experience with Michelin's City Grip on front and rear. Handling is excellent with confident cornering and great braking traction. And, they are very affordable! My new regular shoes. I just noticed strange uneven wear in the rear tire thread. It looks like 1/3 of the thread pattern is almost completely gone and tire looks completely bald while 2/3 (the rest of the tire) is showing normal thread wear. Most of my riding is on highway and this is the first time I had to replace tires on the Wing. I checked for pressure weekly running on 32psi. Currently in use Michelin Power front+rear, purchased Michelin City Grip to replace the worn rear tire. Any ideas why is this happening? I wonder if this will affect new tire as well. What should I check for to prevent new tire to be ruined the same way. Rear suspension issues? Belt slapping? If you mount them yourself----spin bare wheel to make sure it is round----and that bead seats correctly, spin tire again to make sure it is round----balance! I have been using "Ride On" for several years. Be sure to check age of tire (number on side of tire) and that is correct size. From last new SilverWings made Honda recommended IRC....I found rear wore square and had best luck/mileage with Michelin Power Pure SC....rear stayed round thruout its life. I had Metzler Feel free's on my 2005. I was very satisfied with them. On my 2007 I went with Shinko's . I haven't ridden long enough on them. My choice for replacement was Heidenau k66, but they were out of stock at the time. I have since read a few reviews on them, and they are not the cat's meow, so to speak. I think I will go with Metzlers for my next change. Definitely not Dunlop's !!!! I had Metzler Feel free's on my 2005. I was very satisfied with them. Jay. Last year, I fitted Metzeler Feel Free Wintec tyres front and rear to my SilverWing. They are terrible! Firstly, they are not even round. The front looks like it has a flat area when spun by hand. I checked to see if it was seated correctly. The rear tyre doesn't run as true as one might expect either. I also thought the tyres were rock hard - even without any air in them! Fred Flintstone would not have put them on his vehicle. Then I started getting low speed steering wobble. I checked the steering head bearings and there was a small amount of notchiness, so I replaced them with taper roller bearings. Even after that, the steering still wobbles and it never used to on previous tyres. I'm not going to wait for them to wear out before replacing. I'll be changing them as soon as I can, but my other bike takes priority for now. Maybe consider a balance check or a bottle of "Ride On" before giving up. Just a thought. Sometimes a seriously out of balance wheel/tire will reveal itself by raising the front or back (for the appropriate wheel) and doing a slow spin to see whether the wheel always drops to the same position. Then balance from there. Maybe you already did this. If so, sorry for my ignorance. Having installed more than 1,000 scooter tires over the years, I have learned a few things. Bridgestone manufactures the best tire, Rounder, Smoother, Long lasting, Non vibrating and the Best handling. In some cases not requiring any weight to spin balance, Most under a half ounce. Some brands are so bad that I do not install them. Spend a few extra Dollars and enjoy your ride, Do not regret saving those extra Dollars as you shake down the road. There is a large menu of bad tires available out there. If you want the best, Bridgestone is the one. Having done this for many years and over a 1,000 tires on scooters, Not something I read some where. 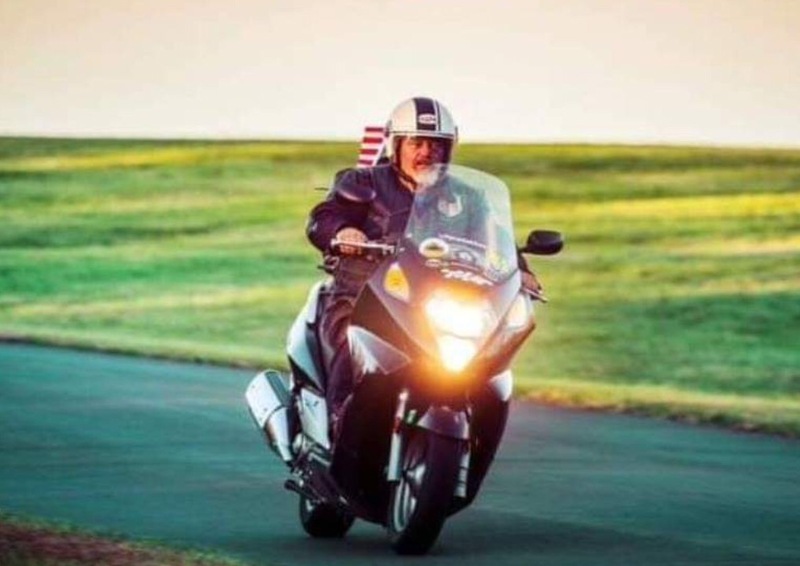 LLoyd may have installed more than 1,000 scooter tires......but how many miles has he ridden on them? Over the years I have had 4 Bridgestone scooter tire failures ,one in Japan Helix rear came apart after long freeway run, 3 in US Reflex just riding, everyday use. None with SilverWing but they were not very good feeling/handling. EX. my new 2009 SilverWing came with Hoops and they were they recommended tire in the owner's manual. New 2013 leftover came with IRC, and they were the ones shown in the book. Ride 'em a lot in a variety of circumstances=they ain't so great. Air must be maintained in even Bridgestone tires. I have done about 500,000 miles on the 15 Silverwing's I have owned. Of course you have, what better way to get through 1000 Bridgestone Hoop tyres. Here's the photos of the tire thread during rotation cycle. As you can see one portion of the tire (1/3) is completely bald. The other side of tire still with significant amount of thread. I could be wrong but I'm thinking wheel itself or shocks. What do you guys think? Enjoy your bikes Lloyd 193. Hard braking during intial wear period ? Out of balance tire, Run to the point of now being severely out of round, Bouncing, Causing the condition pictured here. I have seen this many times over the years. Many riders depend on balance beads to balance their tires, This is prevalent with their use. I charge extra to change tires containing beads and all that rubber dust worn from the tire inside, Big nasty mess and greatly shortened tire life. Check your shocks to determine if this Tire bouncing has worn them out. Set your shocks on a lowest setting so that your tires remain in contact with the road surface. Derrill, It means that these tires are round, Not egg shaped as many cheaper tires are. Appreciate all the input. I think I know now why I was having those weird 1-2 seconds repeated vibrations during my high speed freeway rides. I will talk to my mechanic about this issue and see if he can do something about it. Last time I checked he was unable to balance small size wheels in his shop. If that is not possible, bottle of Ride-on should help. My front tire bounced like crazy before Ride-On treatment. Way better now...I hope it helps with the rear too. I'll update once I have my scoot back from the shop. I've never seen a tire wear like that strange. I have same tire and it's worn to wear bars but evenly. Tire balance or shocks. Did you ever see a car with a bad shock going down road? Wheel bounces over the slightest bump, how can someone not feel that? Sarcasm here is great. I'll agree with llyod193 on that tire wear. Please do not put that stuff in your tires, Clean your bead area on your rim thoroughly. Mount your tires using a soap or tire mounting liquid. Inflate to about 50 LBS allowing tire to seat properly to the rim with the dot aligned with your valve stem, Reduce pressure, 30 front 35 rear. Carefully balance your assemblies, If you can't balance, have a shop do it for you. If you do this properly with a high quality tire you should get ten thousand out of the rear and twenty thousand out of the front. That is my statement to mildew, Can't you come up with an original insult? what is wrong with Ride On? I do own tire mounting....of course clean bead of rim carefully...for good seal....shops often do not do that. I have balance stand, but with Ride On----can and sometimes do check static balance and run out of tie/rim. Then add Ride On, if run out ok-----With Michelin Power Pure SC, have exceeded 10,000 miles with these rear tires on both SilverWing and Burgman 400.....not that I like to run tire that long,(getting bald) but returning from long trip and no source of tires forced the issue. Just be extra careful in rain. Depending on shops that cannot or do not balance 13 inch wheels---Ride On saves the day. It's obvious to me that you can't, you've probably used mildew now as many times as the number of Silver Wings you claim to have owned. Anyway I'm not playing your silly game today and as that old Limey saying goes "You're more to be pitied than scorned". So back to tyres, and as you're the self appointed forum expert, how about one of your pearls of wisdom about my current choice the all season Continental ContiMove 365’s. I'm finding that after many years exclusively on Bridgestone Hoops, with rear tyres squaring off and a delamination blister, I'm pretty happy with them. But what do I know. Sorry to hijack this post but its getting rather boring reading about this constant Dissing other members, the have's against the have not's , the doe's against the do not's, every ones got there own opinion lets just get back to a few more jokes, it made a far more interesting forum to read. Pud. Further to Vmaximus' comment; CAUTION! This conversation has gotten hijacked and heated. Somebody's gonna get chill time. I have never seen a tire wear like that. It looks like it wears out progressively around the circumference, going deeper. My best guess is the wheel itself or a bad batch of tire compound or defect during manufacturing. I would also check that the parking brake is not engaging partially, without triggering the warning light. Could be a warped rotor too. I think a careful inspection of the rear end is in order. Try another brand of tire and see if the problem persists. Could be a warped rotor too. I think a careful inspection of the rear end is in order. Best bet yet I reckon, it has got to be smothing with a direct relationship to the worn area, deffo NOT anything to do with bouncing/shock absorber setting as that would be random position of the wheel when landing. This is more meaningless drivel, I have explained that this problem was caused by a not balanced tire assembly. There is no mechanical problem with this bike, Check those shocks. I publish only useful professional information from a 65 year experienced rider and professional scooter mechanic, Tool and Die Maker and Master Machinist Not from some inexperienced kid. Just because my opinion differs from yours does not automatically mke it wrong or meaningless drivel, what's more I honestly do not give a flying ferk how many tyres you have fitted or what qualifications you have, they do not automatically make yours the only opinion that matters.